CHAPEL HILL, N.C. -- George McGovern was an unwavering, often unrequited advocate for liberal Democratic causes. He pursued those goals in plainspoken, usually understated, Midwestern style. He was a dedicated, decent man, a devoted Democrat even when the party establishment turned away from him in defeat. 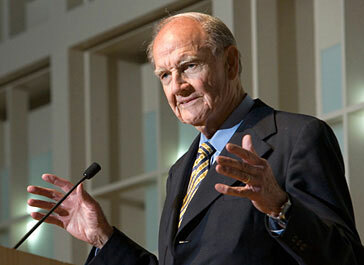 CHAPEL HILL, N.C. — George McGovern was an unwavering, often unrequited advocate for liberal Democratic causes. He pursued those goals in plainspoken, usually understated, Midwestern style. He was a dedicated, decent man, a devoted Democrat even when the party establishment turned away from him in defeat. He wasn’t good at political gamesmanship. He suffered his worst blunders when he strayed from straight talk in his doomed 1972 presidential campaign. It didn’t fit the man and it shook the credibility he treasured. Sen. George McGovern, an iconic liberal who lost to Richard Nixon in 1972 and later lionized for his staunch opposition to the Vietnam war, died Sunday. McGovern was a partisan without the poison that increasingly infected American politics. In his career-long quest for programs to feed the hungry, in the U.S. and worldwide, he worked in partnership with Bob Dole, former Republican leader of the Senate where they’d both served. During his years of political retirement — he lost his South Dakota Senate seat in 1980 — McGovern remained active, lecturing, teaching and writing. He even waged a token presidential campaign in 1984. He’d also run briefly for the 1968 nomination after the assassination of Sen. Robert F. Kennedy. That was the essence of his program during four terms in the House, three in the Senate, and a doomed and crushed presidential campaign in 1972. By the time he was nominated for the White House, McGovern had been marginalized by rivals in his own party, who argued that he was too far left to be elected. That probably was so, but President Richard M. Nixon was the overwhelming favorite against any Democratic challenger. McGovern got just 37 percent of the vote to Nixon’s 61, carrying only Massachusetts and the District of Columbia. Embittered, he considered whether to even stay in politics, especially as other Democrats made him a symbol of what ailed them and kept him off their stages. McGovernite became a label for losers. But he went back to the Senate, and within months he could joke ruefully about his landslide loss. “I opened the doors of the Democratic Party and 20 million people walked out,” McGovern later joked of his reform commission, which had broadened the nominating process, driven out the old party bosses and ultimately made the presidential primaries the arenas for choosing nominees of both parties. There was nothing strident about McGovern; even when his words were harsh, his delivery tended to be bland. As a young man, he had been a warrior, and a heroic one. As a senator, he opposed U.S. involvement in Vietnam from the beginning, in 1963. Arguing in 1970 for legislation to cut U.S. war spending and force troop withdrawal, he offended his colleagues by telling them, “This chamber reeks of blood,” vehement words delivered in the matter-of-fact McGovern style. His 1972 presidential campaign proposals included withdrawal from Vietnam, amnesty for draft evaders and steep cuts in the Pentagon budget. For a time, he also advocated a $1,000 tax grant to every American to replace complex welfare and income support programs, saying the needy could spend it and the wealthy would pay it back in taxes. It came with no numbers, no estimate of the cost, although McGovern claimed, against arithmetic and logic, that it would balance out at zero. He dropped that idea, but the Republicans never did. That spoke to one of his chronic political problems. He was an idea man, not a manager. Witness the uncontrolled chaos of his nominating convention, dramatized when assorted Democratic interest groups spent so much time talking that McGovern did not get to deliver his own acceptance speech until 2:48 a.m., long after the TV audience had gone to bed. But one of his best-remembered, and most unfortunate, lines came later — after his unvetted selection of Sen. Thomas Eagleton of Missouri as his running mate turned into a political disaster with the disclosure that Eagleton twice had undergone electric shock therapy for depression. McGovern said he was “1,000 percent” for Eagleton and wasn’t dropping him from the ticket. But he had to. Then he had to shop for a running mate, with five Democrats declining before Sargent Shriver finally said yes. So if there’d been any doubt about his outcome against Nixon, it was erased before the fall campaign even began. McGovern was frustrated because Nixon stayed at the White House and seldom campaigned at all. McGovern called him the most corrupt president in American history, as The Washington Post published a succession of Watergate disclosures. Nixon just denied it all. The political pain would ease. More devastating was the death in 1994 of his daughter, Teresa, who had suffered mental illness and alcoholism, and froze to death in a snowbank near a bar where she’d been drinking in Madison, Wis. “You never get over it, I’m sure of that,” he said. “You get so you can live with it, that’s all.” McGovern and his wife Eleanor, who died in 2007, had four daughters and one son. McGovern wrote a book, “Terry,” about his daughter’s life struggle, the family impact and his own worry that his political preoccupations had somehow contributed to her troubles. He used the proceeds to open the Teresa McGovern Center in Madison to help others afflicted by addictions. As a candidate, McGovern had to fend off conservative claims that he was weak on national defense, a naive peacenik — that he had, according to the far right, shirked combat, which was a lie. He was a decorated World War II pilot with 35 combat missions in B-24 bombers. That he did not was typical George McGovern.